Shoppers' popular holiday gift card offer is back! 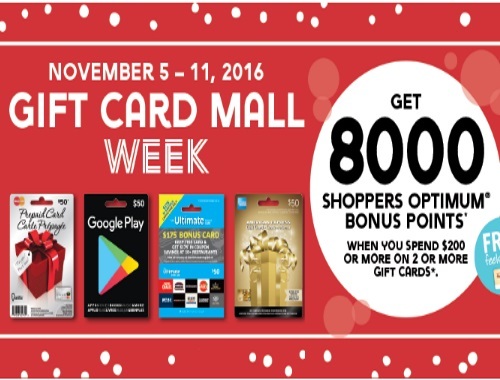 Get 8000 Shoppers Optimum Bonus Points when you spend $200 or more on 2 or more gift cards! Offer is valid November 5-11, 2016. Points to be awarded to your account by Friday, November 18, 2016 for eligible transactions. Offer limited to three (3) eligible transaction per Optimum cardholder number. Maximum of 8,000 Bonus Points per eligible transaction regardless of total dollar value of transaction. All products must be purchased within the same eligible transaction.